It was a return to a former stomping ground for Cllr Tom Mahoney, who spent 20 years working out of Rugby station, first as a train guard and then as a driver. During Tuesday's (23 October) visit, Cllr Mahoney was taken on a tour of the station's platforms and facilities, which include bike hubs where commuters can store cycles in secure, sheltered rooms. He also talked with staff before presenting members of the Virgin Trains team with a Simple Thank You certificate. Thousands of passengers pass through the town's railway station every week and from my own experience I know it can be a demanding environment to work in. Staff do a tremendous job looking after passengers and offering a friendly welcome to visitors to Rugby, and I was delighted to say 'thank you' to the team on behalf of the borough. This is a great initiative. "I'm incredibly proud of the team at Rugby and I can't thank the Mayor enough for taking the time to pop down to say 'thank you'. It really meant a lot. 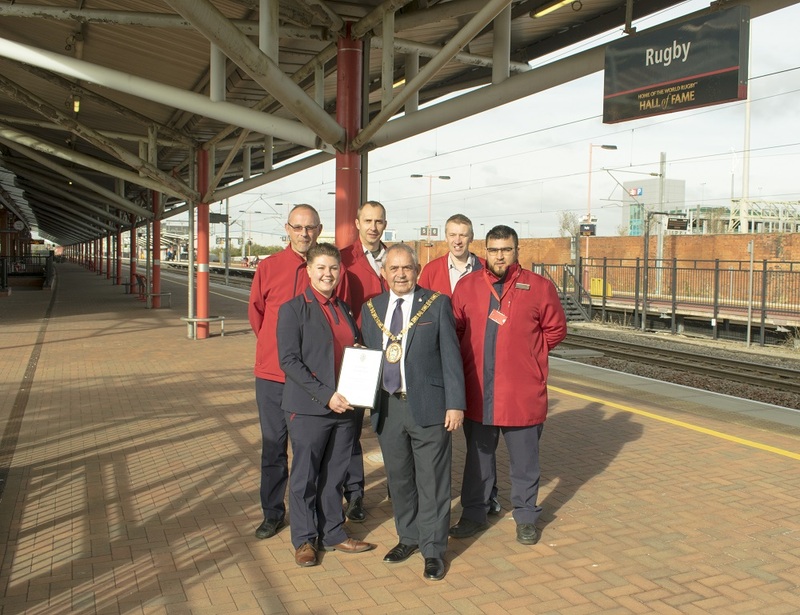 Photo caption: The Mayor of Rugby, Cllr Tom Mahoney, presents a Simple Thank You to members of the Virgin Trains team at Rugby railway station (left to right) - Tim, Samantha, Chris, Tony and Umar.